Although the basic concepts of buoyancy and initial stability were well known in 1860, the calculation of large angle stability was onerous, yet capsizes of ships such as the ironclad Captain in 1870 had shown the need to do so. Fortunately Amsler came up with his mechanical integrator in 1878, a concept later extended to the integraph, which allowed bending moments and shear forces to be calculated for demanding vessels like large passenger vessels or warships. Previously calculations of midship section modulus had been based on approximations like Max bending moment = k x Displacement x Length, although for most ships, scantlings were based purely on tables related to tonnage or main dimensions in Classification Society rules. It then became possible to evaluate the benefits of for example higher tensile steel, e.g. in destroyers and torpedo boats, and of longitudinal framing, e.g. Isherwood’s system of 1908. Simple beam theory applied to the midship section had been shown by experience to produce scantlings of adequate strength for seagoing ships in association with nominal stresses. Froude’s towing tank first at Torquay (in 1872) and then at Haslar near Portsmouth, based on his law of comparison between model and ship resistance, provided the means to explore a great variety of hull forms as well as predict power with greater confidence. It was this latter advantage that persuaded shipbuilder Denny of Dumbarton to build the first commercial towing tank in 1883. The company built many high speed and shallow draft ships, so a more accurate prediction of power enabled them to determine dimensions and hull form and to size the machinery with greater confidence and lower margins when tendering. By this time, the major Classification Societies had become well established, Lloyds Register starting in 1760 (100 years before RINA), Bureau Veritas in 1828, American Bureau of Shipping in 1862, Norske Veritas in 1864 and Germanischer Lloyd in 1867, to be followed by a British (or rather Scottish) rival to LR in 1890, the British Corporation, and Nippon Kaiji Kyokai in 1899. These societies also assigned freeboards, statutory in British registered ships from 1890, but not agreed internationally until 1930 ­ one of many steps towards the level playing field so necessary to an industry like shipping. Indeed such subjects were regularly discussed in the various technical forums such as (R)INA or North East Coast Institution of Engineers & Shipbuilders (1884) or Society of Naval Architects & Marine Engineers (1893). With its large merchant fleet, Britain often took the lead in establishing new safety legislation covering matters such as life saving appliances, tonnage rules, subdivision, crew qualifications and provision of navigational aids, enshrined in major legislation like the Merchant Shipping Act of 1894. Other late 19th century technical developments which enabled bigger, better and faster ships to be built included forced draft for boilers (increasing power output and reducing fuel consumption) and electrical generators (including some early steam turbines) permitting electric lighting. This was particularly useful in larger ships with extensive accommodation like passenger ships and battleships and in engine rooms where guttering oil lamps or candles were the only alternatives if no natural light could be arranged. Electrically driven machinery began to make an appearance both on board ship and on docksides, simplifying power transmission. Manganese bronze propellers (usually then blades bolted to the boss) reduced erosion and corrosion as well as improving efficiency in high powered vessels, albeit at higher cost than cast iron. The most significant enabling technology at the start of the 20th century was the introduction of the steam turbine. Although Charles Parsons is regarded as the pioneer, there were also designs prepared in the USA, Germany and Sweden. The turbine offered almost unlimited power compared with the steam reciprocator, and in a smaller engine room and with less vibration, although initially fuel consumption and cost were much the same. Following Parsons’ experiments with Turbinia in 1894-97 (now on display in Newcastle’s Discovery Museum) Royal Navy applications progressed rapidly from destroyers to cruisers, and then to the battleship Dreadnought ordered in 1905. In parallel, merchant ships moved from the 3000-shp Clyde ferry King Edward in 1901 to the momentous decision by Cunard in 1904 to order 70,000-shp turbines for their 25-knot transatlantic liners Mauretania and Lusitania. This sixfold increase in power from destroyer Viper’s 11000-shp in 1900 was just as bold as Brunel’s step from the 3000grt (gross registered ton, a measure of volume not weight) iron steamer in the mid 1850s to his 18915grt Great Eastern. But unlike the latter, the Cunard liners were a great commercial as well as technical success. What modern engineer would make a six fold jump in capability in only four years? Figure 7. The decision in 1904 to use steam turbines in Cunard’s express Atlantic liners Mauretania and Lusitania was a momentous one, coming only ten years after Parsons had installed his first experimental turbine in Turbinia. The 70000 shp developed on four screws enabled them to maintain 25 knots with ease; they were a great technical and commercial success. 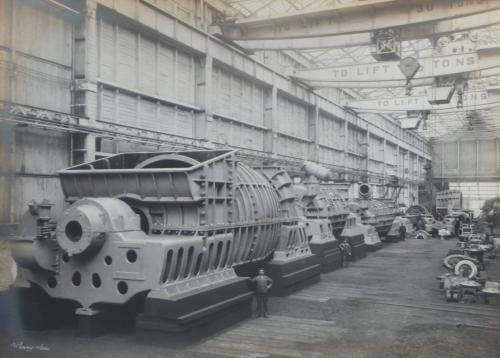 The photo shows Mauretania’s direct drive turbines in the erecting shop at Wallsend Slipway & Engineering company’s works in 1906. The early steam turbines were coal fired, so boiler capacity and firing rate were limitations on sustained power. Many new designs of watertube boiler were developed offering greater steam raising capacity, but few survived more than a few years, Babcock & Wilcox being one the most successful. But experiments with oil fired boilers had started in the 1880s, so by the early 1900s, successful designs of burner had been developed. From about 1914 all the major vessels of the Royal Navy used oil fuel, not just the newly developed submarine with its internal combustion engines. Although more expensive than coal either on a weight or calorific value basis, the weight of fuel was less, it could be stowed in awkward compartments like double bottoms, it greatly reduced the number of stokers to be carried, and it did away with the slow and dirty business of coaling ship. Higher powers also required improvements such as the compact reliable Michell thrust block. The same decade (1900) saw the application of the oil engine to marine propulsion, initially only in small vessels. Its greatly increased thermal efficiency (32%) ­ hence lesser fuel load ­ quick starting and compact space and uptakes spawned many designs. After Burmeister & Wain had developed the directly reversible diesel, the way was clear to use them in deep sea ships, resulting in the Danish Selandia of 1912. Take-up of the diesel was delayed by the First World War, where maximising production from existing manufacturing facilities was paramount. Between the wars, different shipowners took different views on the potential problems of lower reliability, more expensive distillate fuel, greater maintenance and repair bills, more skilled operators and modest power per cylinder. Thus steam reciprocators retained a significant share of the marine propulsion market into the 1940s, indeed the 2648 Second World War Liberty ships all used a British design of triple expansion engine. Figure 8. 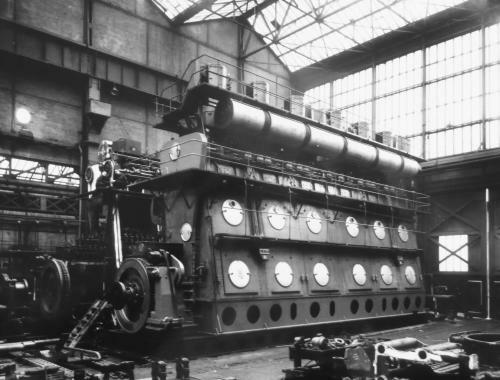 Burmeister & Wain in Copenhagen produced the first diesel engine for deep sea ships for cargo vessel Selandia in 1912, offering much lower fuel consumption than steamships, albeit at higher construction cost. Over the next decade, many designs appeared but few were successful. The Doxford opposed piston engine with good balancing characteristics went to sea in 1921 and remained a popular engine for the next 40 years. Here one of their 6 cylinder 6600bhp engines for the twin screw Portuguese liner Angola is in Hawthorn Leslie’s erecting shop in 1948. There was little evolution of ship types between the two world wars, not so much due to lack of technology but due to economic stagnation and little growth in world trade. Apart from transatlantic liners reaching 80,000grt and 30knots (Queen Mary, Normandie), cargo ships and tankers remained around the 8000grt mark, whose speeds had barely increased either, with around 11 knots. 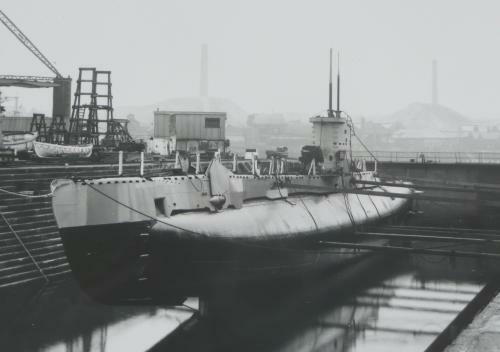 Progress was more in refinement of designs, with tank testing producing better hull forms (including the Maierform), streamlined aft ends and rudders, exhaust turbines added to steam reciprocators, e.g. Bauer-Wach. The first steel hatch covers appeared, offering greater strength, safety and quicker opening and closing ­ a boon to coastal colliers with their short voyages and low freeboards. But the traditional steel beams, wooden boards and tarpaulins were not completely replaced by designs like MacGregor covers until the 1950s. Wireless became mandatory on ships over 1600grt in 1919 which not only reduced casualties but improved commercial efficiency. Electrical generating capacity increased, so electric motors started to replace steam driven auxiliaries, especially on diesel ships. Higher standards of subdivision in passenger ships were introduced in 1930. Particularly in passenger carrying ships (there was as yet little challenge from air transport) innovations were introduced such as partial air conditioning (first class passengers only! ), fin stabilisers, gyro compasses and echo sounders. Nozzle propellers were installed in tugs to increase thrust, while the first controllable pitch propellers appeared in a few smaller ships. Crew accommodation slowly improved. Seamen moved from forecastle to poop (more space, lesser motions, drier), separate eating and washing places (with hot water!) were introduced, and refrigerators allowed a wider range of food to be stored ­ no more coops for live chickens or sheep! As yet number of crew remained high at 40-60 on a typical deep sea cargo ship, only showing a reduction in ships where oil replaced coal. Figure 9. Welding technology, although developed in the 1900s, became more widely used in the 1930s, especially for tankers. Making really oil tight riveting was difficult, so it was no surprise that they were the first ship type to make wide use of welding. In Second World War, welding was used for American mass production of Liberty cargo ships. 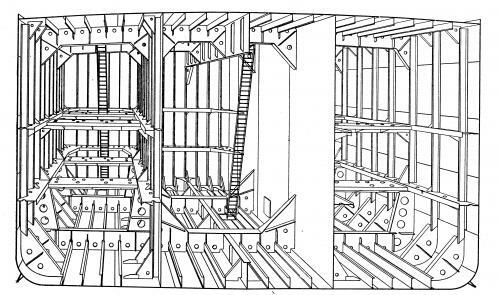 Full scale structural tests were made on welded and riveted ships in Britain; the cross section shows one of the tankers so tested. By the 1960s, the transition from riveting was complete. Lighter smoother hulls paved the way for ever larger ships. Welding came of age in the 1930s. Introduced in the 1900s using gas, the shielded electric arc was developed in time for WW1, where it proved useful in awkward repairs. The first all-welded seagoing ship was the coaster Fullagar built by Cammell Laird in 1920 (at a loss!). But welding was regarded as expensive, unproven and less reliable than riveting, especially for main hull structures. So it tended to be used where there were clear advantages such as oil tight bulkheads in tankers or oil fuel bunkers, where really oil tight riveting was difficult to achieve. It took the high production demands of WW2 to bring about the widespread use of welding. The huge emergency shipyards in the USA were laid out for all welded prefabricated construction, with large welding bays, heavier cranage and ample storage space for units ­ and needing less skilled labour. Without welding, the US would not have been able to build the 5000 ships that the Maritime Commission produced between 1941 and 1945. But there were still problems to be solved with brittle fracture, requiring the development of notch tough steels in the late 1940s, and the need to integrate design and construction more closely, both in terms of detail design to remove stress concentrations and in block assembly methods. But welding brought significant performance advantages in terms of lower structural weight (typically about 15% by removing overlapped riveted joints, flanges and connecting angles) and in smoother hulls, typically about 20% less resistance. Ramsay Gebbie of Doxford made a careful comparison of an all-riveted and an all-welded cargo ship of equal cargo deadweight (9515 tons) and speed (14 knots) in his 1958 Amos Ayre INA lecture. He concluded that owing to the lighter, smaller and smoother hull, power and fuel consumption were reduced by about 20%, and building cost by about 12%, while the profitability of the riveted ship was at best 90% of the welded ship, and could be as low as 52% depending on freight rate, fuel price and port time. By 1960 the transition was complete. Figure 10. The submarine enabled smaller navies to strike at larger navies using the torpedo. Airless underwater propulsion (electric motors and batteries for the first half century), safe submergence and surfacing, and control in three dimensions were demanding technologies. Medium speed diesels were the prime mover of choice for surface propulsion and battery charging until nuclear power arrived in the 1960s. The shape of the British Uther of 1943 shows to advantage in drydock, with the prominent ballast tanks.